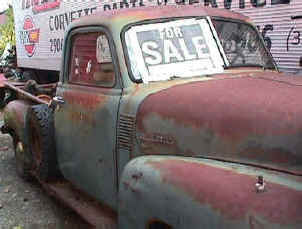 E-mail us for all your Chevy Truck needs at sales-201306@TracyPerf.com. 1980 Chevy Extended Cab Pickup C-10 2WD, 350/190 Engine, TH 350 Automatic Trans, 3.08 Positraction, A/C, Power Steering, Power Brakes, Power Windows, Power Door Locks, Power Seats, Power Antenna, AM-FM Stereo Cassette, Black Leather Interior, Red Exterior, Aluminum Wheels, Goodyear Eagle GT Tires, Needs Rear Springs, $9999 Firm, Near Toledo, Ohio, John Doe, 123-456-7890 Days, or E-mail to jdoe@wxyz.com. A/C, Power Steering, Power Brakes, Power Windows, Power Door Locks, Tilt Steering Column, AM-FM Stereo Cassette with Equalizer, Burgundy Cloth Bucket Seats, 5 Passenger, Approximately 100,000 Miles.